Explore scenic Lake Como in Italy's beautiful Lake District on a day trip from Milan. 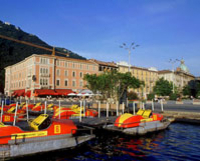 The fashionable lakeside town of Como is just a short drive from Milan, surrounded by snowcapped mountains. After spending time shopping and dining in Como, you'll take a two-hour panoramic cruise on Lake Como to the enchanting village of Bellagio.